This post will cover my May Day / Beltane altar for 2017, complete with a full description, photos and a correspondence image. 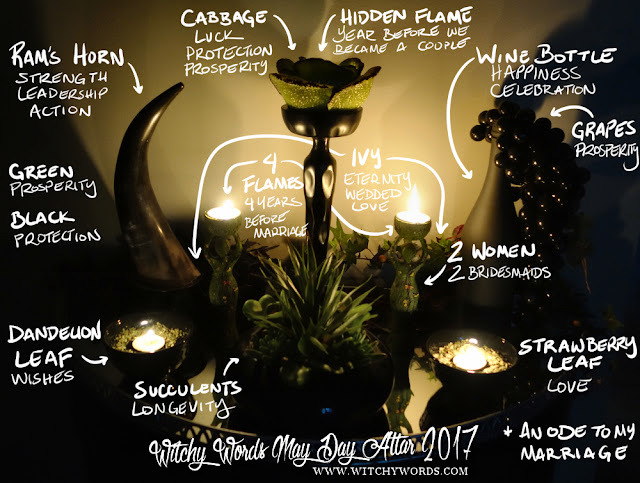 Because Beltane and May Day are a holiday of love, love-making and fertility, and typically representative of marriage in various neopagan traditions, I wanted to focus this year's altar as an ode to my marriage. This was especially relevant because we celebrate our dating anniversary on May 4th - right around May Day. While it may appear generic and standard on the outside, this altar, like my marriage, has deep meaning and symbolism. Because of this, this altar is incredibly personal. I hope you enjoy it! On this altar, there are five candles. Four flames are easily seen and one is hidden. 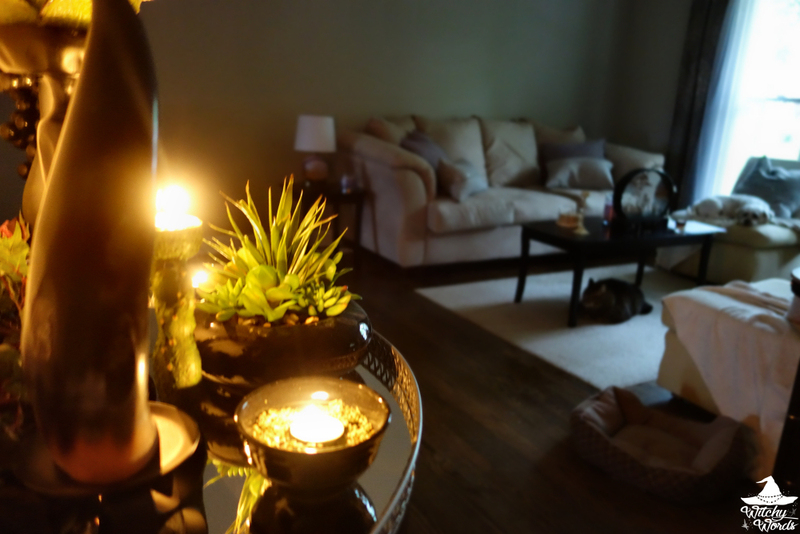 The four candles that are easily seen are the four years we dated that led to our marriage. 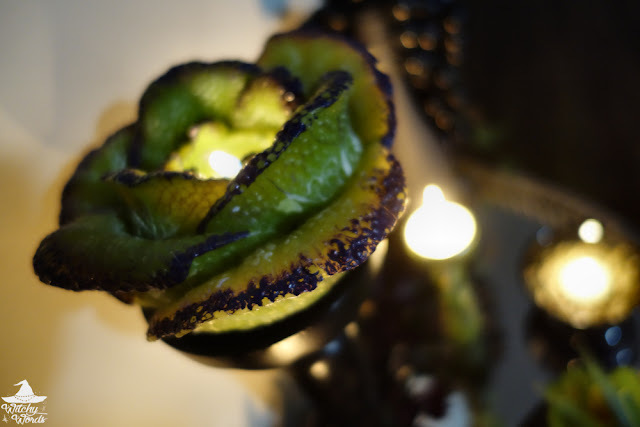 The one hidden is a cabbage, which often symbolizes luck and protection. That hidden flame represents the one year prior to us dating where we chased each other much like a high school romcom. I put it at top because it then cascades down to the other four flames. That one year led to four years of dating. The rest of the altar then represents our marriage! You'll notice two maidens on the altar. Those represent the two bridesmaids I had at our wedding. On one side of the altar stands a polished ram's horn. Rams often represent strength, leadership and action. Both my husband and I are in management/owner type positions at our job. My husband is an IT Coordinator and I'm a small business owner and independent contractor. In addition, we tend to take the reigns in other aspects of our life, as what I do with my circle. That leadership has been pinnacle to our marriage. The other side of the altar features a wine bottle and grapes. Wine represents happiness and celebration, the lifeblood of our marriage, and the grapes represent prosperity. Of course, in the back, you can see ivy lining the entire altar. Ivy represents wedded love and eternity and was particularly fitting for this altar. On the side of the altar with the ram's horn, the offering bowl in front contains dandelion leaves. These represent the hopes and dreams we see coming to fruition, and were placed on the side involving pasture and animals. On the other side with the wine bottle and grapes, I have strawberry leaves which represent love. These were of course placed on the side with other berry-related fruit. Finally, in the center, I set a bowl of succulents. Succulents represent eternity and longevity, my hopes for both our relationship and our lives, as well as the lives of our pets, friends and family. 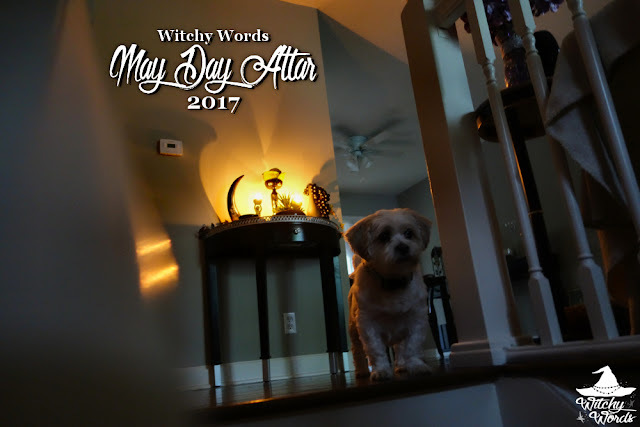 Enjoy this May Day altar as an ode to my marriage! Beautiful! Happy anniversary, it was nice getting to know you a little better!